Solve the mystery of the Mysterious Island! 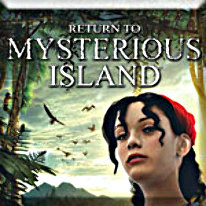 Return to Mysterious Island follows Mina, a strong young woman alone on a round-the-world sailing expedition. Caught in a tremendous storm, she becomes stranded on the shores of a wild and apparently uninhabited island. As she explores her new surroundings, she uncovers artifacts, living spaces and technologies left behind by the people who came before her to this uncharted island. Creating a new life, Mina builds a home from the remains of Granite Rock and uses her survival skills against the wilds of the jungle. She soon becomes aware of a figure in the shadows who, seemingly aware of her troubles, offers her assistance. She eventually identifies this figure as the unsettled ghost of Captain Nemo, whose body is located in the Nautilus deep below the island shore. Piecing together the hints and clues he provides, Mina must travel to the Nautilus, retrieve his body and give him a proper burial in order to free his tortured soul.